Industrial Ethernet provides higher bandwidth, more performance, and the ability to connect more network nodes at longer distances. Operational amplifiers are used in many systems across a broad range of applications. These systems operate over a wide range of conditions. Op amp open-loop gain and open-loop output impedance are the two main small-signal AC parameters that affect the stability and frequency response of an op amp circuit. Perceptual computing, whilst a relatively new term, is far from a new technology and one engineers have struggled with truly realizing for decades past. While connecting previously isolated devices on the Internet of Things (IoT) yields countless possibilities, it has also forced industry to reconsider how these seemingly harmless edge systems could be leveraged with malicious intent if not properly secured. In this interview with thought leaders from the Trusted Computing Group (TCG), Steve Hanna of Infineon and Stefan Thom of Microsoft discuss why security must begin at the hardware level, and explain how the TCG's Trusted Platform Module (TPM) and Trusted Brokered IO specifications are evolving to meet the requirements of the IoT. Raspberry Pi Trading is partnering exclusively with element14 to provide customized Raspberry Pi A, B/B+, Compute, and Pi 2 model designs for use in industrial and commercial applications. This is the first time customized Raspberry Pi boards are available. The technological basis for Industry 4.0 has long been available – but what is often lacking is the courage to make it a reality. Promises of efficiency increases, even with smaller quantities and custom production of single products, are linked to costs and security risks. But for most companies, there is no alternative. Download data sheets and pricing now! SYNOPSIS: A one-hour, live, moderated problem/solution technical webcast. For additional E-casts, check out the Broadcast Archive. Volume 2, Issue 2 of Embedded Computing Design's IoT E-mag provides practical methodologies for capitalizing on your Industrial IoT investment, as well as looks into optical sensing innovations, dual-wireless protocol solutions, and more. 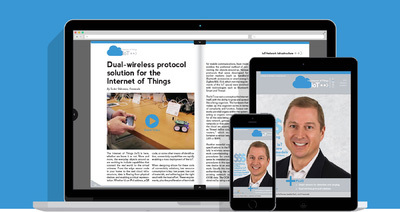 Subscribe to Industrial Embedded Systems in print and online.